This EA is a free version of Wolfgrid EA. Unlike the full version, some functions are disabled and the parameters cannot be changed. Lot size is set to 0.01. Wolf Grid EA is an expert advisor using customized indicators to identify trend reversals. The entries are usually accurate and in case if the trend reverse with a delay the positions will be managed by a smart grid system. 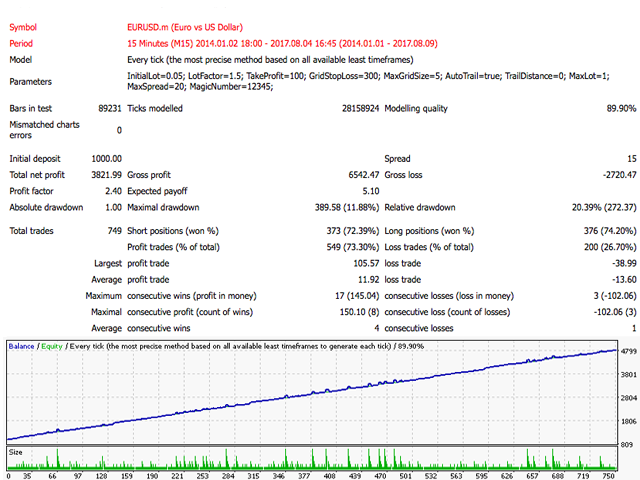 In order to get better profit an automatic trailing stop has been implemented to assess the best trailing stop value based on the volatility of prices. I have worked hard to ensure that everything I do puts my users interests first. Asking for feedback and ratings should especially be a net positive user experience. It will help me to improve my trading strategy. Тестирую на демо, результат хороший! Great FREE Ea but keep your risk levels low.